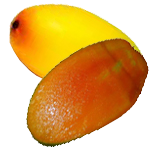 This is the most famous Mango from the Northern Indian sub-continent and is one of the sweetest Mangoes that exist!! The legend of Dussehri is embedded in the folklore and culture of India. A celebration is incomplete without a serving of Dussehri. If celebration was an image, you could safely replace it with a Dussehri. During Dussehri-season family and friends, young and old, all get together to experience the heat of the sun, the coolness of the wind, the music and joy of the rain, and Dussehri- what an experience!! The most famous Dussehri comes from the Malihabad region of India near Lucknow in the state of Uttar Pradesh in India. It is also grown in all the North Indian states and the state of Punjab in Pakistan. The best time for this Mango is during the first two weeks of July.